COMIC OF THE MONTH: SAGA #19 Only one comic could start with a 'splash page' of the birth of a tv-headed baby, with only a test-pattern face so far 'pushed through', and that is Saga from Image Comics. Note, the kids not WiFi yet. Fast forward several months from the last issue and writer Brian K. Vaughan with artist Fiona Staples, don't waste time dealing with the repercussions of the elapsed period - infact they in-panel tell us not to worry 'you'll catch up', continuing to write and draw one of the most realistically written casts in all of comics. Alien genocidal war backdrop notwithstanding. Throw in the words 'skish', 'sister', 'bus-fare' and 'menstruated all over the living room' and Saga (despite a brief hiatus both real and fictional), is still the best reason to read indie I've ever met. 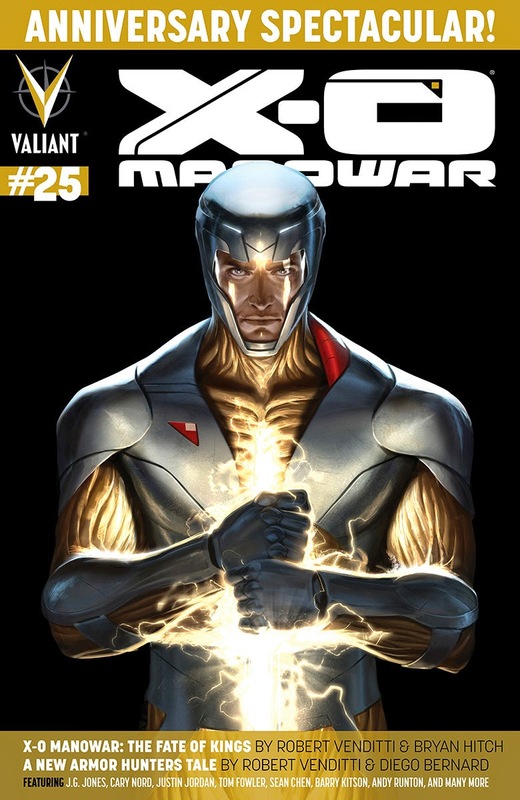 X-O MANOWAR #25: Cheers to Valiant for doing an anniversary issue worthy of the title. This celebratory number has all the things that used to make bumper issues so sweet; a one page origin recap, a story that teases the future, a centre spread pin-up, handbook pages of the cast, behind the scenes excerpts, top creators, one of the best covers of the year and more. While I'll admit my favourite was the Owly and Wormy kid friendly tale Armor's Day Off, I have to ask how come the company putting out the best modern take on a classic comic staple is also one of the newest? NEW WARRIORS #5: Despite Faira Sar Namora's horrific visions of the team, this book's drama is almost lost in a sea of jokes, some of which are still running from the first issue. New Warriors should be young heroes trying to find humour and truth in a dark world, not rowing in the complete opposite direction - super-sped by artist Nick Roche's art style. The saviour, is that the dark interludes are stunning. Case in point: the Penance side of Speedball mentally warning the telepathic Hummingbird not to read his thoughts on his 'self cutting' or 'dark side' again, while multi-tasking as Speedball, he chats with the rookies over a table full of Romanian food. How does a guy with no mouthpiece eat a sandwich anyway? MOMENT OF THE MONTH: HARBINGER #23 Fulfilling what I said The New Warriors should be above, this issue hyped as 'Dead means Dead' delivers on it's promise. While I won't reveal which of the Renegades falls here (in the best death scene since Blue Beetle, Ted Kord), I will say it is just one of an issue of killer moments, as the on the run Harbingers turn and face their rival Toyo Harada. Multiple assault fronts, multiple twists = multiple cool. While the anniversary issue is not far off, ending the series, with Harbinger: Omegas set to rise from its ashes, I hope folks don't wait till the new series to jump on board. With issues that deliver this much punch, the more that go past, the more you really miss out. The only bad thing about Saga is there's not enough Saga. In fact, every time a new issue comes out I squeal delightedly "Saga!" and when I'm done reading it I groan despairingly "Saga!". Out loud. My children think I'm nuts. BKV is my favorite current writer, which is saying a lot, I didn't think anyone would ever push out Gaiman. But you are correct about his ability to make such an unrealistic setting more real than anything taking place in the "real world" of the big publishers. His characters have more life and soul without the intense trying you can see evident in other writers. It's effortless. It carries you off before you notice you've gone. Thanks Random - I think you hit the disembodied guardian angel on the head with that last sentence. Every issue of Saga feels like three pages have passed instead of twenty odd. Luckily the letters pages are just as entertaining, or I'd only want to pay half price. No I wouldn't - I'd still pay full price. Glad to see Valiant's comic offerings continue to impress and continue their usual excellence. *I'm talking about the childbirth scene from the first issue, not the computer baby from the most recent one, btw. That's what I find so shocking about Brian's writing style Random. He doesn't do poetry yet he does, he doesn't do soppy yet he does touching. It's like he knows exactly when to stop. Little detail but just enough... I think that's why the infant narrator hasn't got tiring yet. In total agreement. He doesn't talk down to the reader, but seems at the same time to elevate everyone to the same plane without sounding pretentious. He seems to speak a universal language. There are few writers that I instantly recommend to everyone who reads. Not even Gaiman will I do that for, because I know some readers will be put off by some of the imagery and topics. But BKV, he's never missed even with the touchy topics. And that's rarer than rare. It's not even gold. It's a treasure without a price on the stock exchange.